With 22 million people affected by cancer worldwide, including 28,000 new cases a year in the Rhône-Alpes Region, cancer is a major challenge for human beings, the socioeconomic fabric and public health. 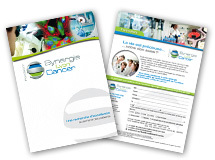 The Synergie Lyon Cancer Foundation is involved as a major actor in taking up the scientific and medical challenge represented by this disease. At present, 800,000 people have cancer in France. For several years, if all cancers are considered together, their incidence has increased while mortality has decreased (365,500 new cases and 147,500 deaths in 2011). Cancer is the second cause of mortality in children from 1 to14 years old. Despite the progress made over the last few decades, there is an obvious need for new therapeutic strategies for both adults and children. These strategies must take into account the complexity of the mechanisms involved in carcinogenesis and lead to improving global survival and limiting morbidity linked to treatments. Although the mortality of cancers has decreased, the disease can lead to certain disabilities. Thus nearly 20% of active persons diagnosed with cancer find themselves jobless two years following the diagnostic. Two thirds of them declare that they are more tired than before and suffer from physical and psychological sequels due to the disease or the treatments taken: impeded movement, pains, disturbed sleep, and problems with memory and concentration. For the Rhône-Alpes Region alone, every year 28,000 new cases of cancer are diagnosed (including 200 children) and 12, 500 deaths recorded. Cancer remains the first cause of human mortality in the Rhône-Alpes Region and in women under 65 years old. On average, treatment given for cancer in this region represents 220,000 stays in hospital a year (including 4,500 in paediatric units), including 291,000 radiotherapy sessions, more than 35,000 stays for surgery and 141,000 stays for chemotherapy. A disease characterised by non-controlled cellular proliferation within the normal tissue of the organism. You, too, can participate in this synergy vital for medical development against cancer by supporting the Foundation.